Islamic Finance for Academicians is a four-day intensive workshop targeted at full time faculty members and researchers of academic institutes, which focuses on development of skills for teaching, training and designing Islamic Finance programs' curriculum, on discussion of potential research areas in Islamic Banking and Finance, Islamic Capital Markets and the scope and challenges of Islamic Finance at the local and global levels. 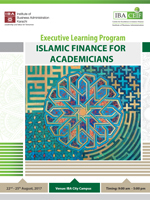 The workshop's core focus areas include emerging areas in Islamic Finance, curriculum for Islamic Finance certificate programs and graduate programs, Islamic Capital Markets, Islamic Law of Contracts, Islamic Banking, meeting with the practitioners and current research areas in Islamic Finance. The cost of this workshop is PKR 85,000/- However, this program is funded by the State Bank of Pakistan and will be free of cost for selected participants. Note: Limited seats are available. Candidates wishing to apply should fill out the Application Form on the CEIF website http://ceif.iba.edu.pk/ and submit their updated CV for selection on ifa.ceif@iba.edu.pk, latest by 7th August 2017. The applications will be processed on a first come first serve basis. Only selected candidates will be contacted.